This page allows you to manage the users of your system. You can create new users, edit existing users or delete users using this page. The users can then be used to restrict the valid recipients of email accepted by Hexamail Guard, determine which users have access to certain features of Hexamail Guard, and hold per-user configuration for various modules in Hexamail Guard. It is not essential that you configure your users, as most functions will operate with no user list. Licensed users can login to access web interface features, unlicensed users cannot. All users will still receive email normally whether licensed or not. 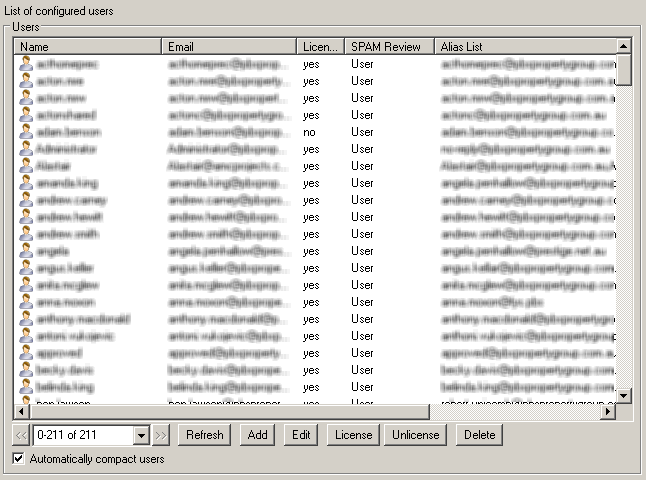 If you have elected to restrict recipients to the users list in the SMTP server module you must remember to uncheck that option if you subsequently clear your users list!